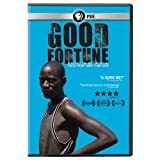 The film Good Fortune addresses a common concern: whether foreign aid or investment dollars really do much good for the people of the recipient developing nation. The film unfolds a tragic phenomenon by "following the money" into two differing settings in Kenya--aid dollars in the slum town of Kibera, outside Nairobi, and investment dollars spent in rural lands of Western Kenya, Yala Swamp. Focusing upon individual lives of Kenyans in each of these settings grants a broader panorama, yet a more personal view, of the effects of foreign financial interventions on the peoples whose lives the funding is purported to improve. The audience is introduced to Kibera from the threshold mountain of garbage that forms the border of the slum town. Beyond the garbage stretches a sea of shabby huts, as far as the eye can see. Footpaths, lined in garbage, weave between the endless rows of makeshift tin-roof huts, and lead into a bustling marketplace, where people are bartering for foodstuffs and handmade goods. We meet Silva, a midwife who came to Kibera from the countryside fifteen years ago, in an effort to support her family. Midwifery had become a dwindling enterprise in rural Kenya, since the people began flocking to the cities, seeking work. Kibera offers few services. There is no trash collection, no clean water, no sanitation. Silva takes us on a walk to nearby apartment towers, lovely structures that she says were built with foreign aid dollars, with the goal of improving the lives of the poor. Some stand empty, unoccupied since their construction, because the rents are so much higher than the pittance charged for a shack in Kibera that none of the poor, for whom they were built, can afford the new lodgings. Other high-rises, tells Silva, were gone as soon as they were completed, given to politicians, their friends, and extended families. The housing crisis is a personal tragedy for Silva and her family, who have been given notice by armed officials that they must vacate their home. Their home and the homes of their neighbors will soon be torn down to build a proper road. The road will bring the much-needed services that some well-meaning foreign investors had promised to the local poor. But these benefits come at the cost of the displacement of a thousand poor Kiberans, such as Silva, who have nowhere affordable to go. "They are mocking us!" she concludes. The scene shifts to the plush green countryside, where Jackson Omondi, his old mother and young family have lived all their lives. Jackson teaches at the local school and raises cattle on the open lands, until six years ago, when an American corporation moved into his area. The Dominions Farms Corporation brought modern ideas and equipment, which they promised would greatly improve the lives of the local people, once they better understood what was happening. The investors gave the local families little choice: they were told that they must sell their family lands or be forcibly evicted by the government. Many acquiesced and accepted the payments. Some received employment on the 26 million dollar rice farm, damming up the river to flood the entire 1100 acre area. Cattle were separated from their owners by the floodwaters. The people are now cut off from the river, their only source for clean water. Their grazing lands have been replaced by a swamp that breeds the dangerous malaria-carrying mosquito. The scene closes with a tragic scene, simple villagers scratching out petitions to press their rights against the huge corporation. It is evident that their fate is already cast, as it is for so many victims of wealthy western companies. As we witness Jackson's mother standing over the garden she has tended for forty years, watching her seedlings drown, we are left with a poignant sense of the enormous personal losses that accompany what the wealthy name "progress." Hope offers a stunning glimpse into the actual effects of investment in third world countries. It shows that the best laid development plans can ruin local people's lives, when the monies are donated far from the site of their investment and there is inadequate oversight of the projects. Moreover, the film shows the devastating effects that the current system of "economic progress" is having on poorer countries in the developing world, where wealthy corporations are given a free hand to pursue their interests at the cost of local lives. This film will be appreciated by any educated audience. It would also be a valuable resource for use in the university classroom, for studies in contemporary moral issues or political science.